The information on this page details the background information, their use in the game and additional details of every unique character in the game. A sprite that can speak is not a significant character, one that affects the plot or has some significance to the game is. 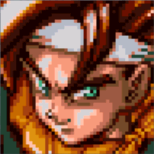 Crono is the classic mute protagonist, a simple avatar for the player, and "a typical teenager whom fate chooses to save the world." He uses swords, and learns lightning magic later in the game. You'll be forced to have him in your party up until The Time Egg but during the last portion of the game, based around side quests, you can choose whomever you want. Crono's best friend is a brainy genius. "She loves science and uses her knowledge to build fantastic machines and very clever weapons." You will have the option to keep her in your party for most of the game. She uses guns, which rely on her Hit stat, and fire magic. Beautiful, kind and buff too! 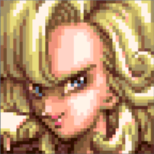 One of four characters in the game who don't give their real name: Marle is actually Princess Nadia, heir of Guardia castle. She dislikes being cooped up in the Castle and "grows impatient with royal life"; a tomboy of sorts. Her weapon of choice is the crossbow; the damage dealt depends on the attack power of the bow and her Hit stat. She learns Water magic (specializing in ice) as the game progresses. 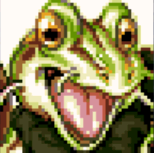 "Frog, once a Guardia Knight, was beaten very badly and turned into a frog." His real name is Glenn, close friend of Cyrus, and is "an accomplished swordsman" who is essential in the fight against Magus. He learns to use Water magic in a different way than Marle. Also known as R66-Y or Prometheus, Robo is a resident of the apocalyptic future who is "trying to remember his master's directions." His electric weapons have a physical or Shadow type of attack. One of the first prehistoric women, Ayla holds her own against men of her time (and all time for that matter) and "is trying to save her group from the reptites." Ayla uses entirely physical attacks since she predates the existence of magic on the planet. Evil on the outside, teen angst on the inside. Magus, known in Japan as Maou (魔王 Maō, lit. Demon King), is the dark wizard waging war against the Kingdom of Guardia in 600 A.D. Magus was originally Janus (Jyaki in the Japanese version), the young prince of Zeal in 12000 B.C. After an encounter with Lavos as a boy, he was sent through a time gate to the Middles Ages. 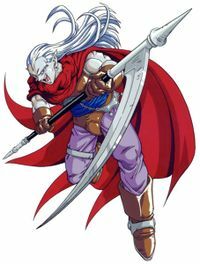 Vindictive and vengeful against Lavos, and eternally concerned over the fate of his sister Schala, he is portrayed as brooding, potent, and gloomy. He fights using a scythe, as well as a combination of all magic types. 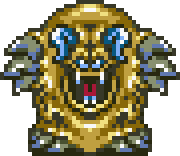 He is an optional character but is nonetheless an iconic cast member of Chrono Trigger, largely due to his major role as an enemy in the game. The word "Magus" is the singular form of the word "magi", a Latin word serving as the root of the English equivalents "mage," "magic," and "magician." Magus' Japanese name Maō translates roughly to "demon king" and is more clearly identified as a title rather than a name. Magus appears in Radical Dreamers as Gil, a shadowy and handsome member of the Radical Dreamers thieving group. He is depicted as masked and mysterious, though gentle and cultured. He has the ability to slip in and out of the shadows of the night at will. 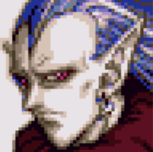 Magus as Gil was also slated to appear in Chrono Cross. However, as development of the game progressed, designers decided it would be too difficult to integrate his complex story into the plot. His character, renamed Guile (Alf in the Japanese version), was thus altered to remove his Magus identity and was left in with no back-story, existing merely as a competent magician seeking enigma in the islands of El Nido. Missing Piece includes a number of discarded character designs for Guile, including one which is more-or-less analogous to Magus' appearance in Chrono Trigger (cloak, pointed ears, etc. ), as well as one in which he appears as a teenage boy. As it stands, Magus is only mentioned in a letter to Kid from Lucca, in which she assures Kid not to worry as "Janus" is probably watching over her. Gil appears in Chrono Cross only in an easter egg designating the events of Radical Dreamers as having taken place in an alternate dimension. In the English version of this easter egg, Gil is referred to as "Magil". Leader of the Reptites, Azala hates the humans and leads the reptites to battle humans for the right to survive. When Crono's gang goes back in time, Azala steals the Gate Key. Her fortress, the Tyrano Lair, gets destroyed by Lavos' descent. 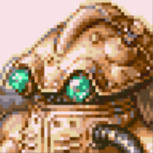 In the Nintendo DS version of Chrono Trigger, it is confirmed that Azala is indeed female. Kino is Ayla's close friend and fellow tribesman. He is considered to be the father of the Guardia Kingdom. Note that the name Kino comes from the Japanese word for "yesterday," a play on his prehistoric existence. The antagonist of the story, Lavos is an extraterrestrial being who, after crashing to earth, resides in the core of the planet, slowly draining its energy and wreaking havoc across its surface. Lavos' final form, accompanied by two bits. Magus's younger self. Has a purple cat named Alfador and is Schala's younger brother. It's unknown as to who the first ruler of Zeal was, but perhaps Queen Zeal was always Queen. She has two children, Schala and Janus. Overcome with greed by the already lustrous power of the Enchanted Ones, she succumbs to the will of Lavos. Under his influence, she focuses on extracting power from him to undergo more development within the kingdom. She led her people and ordered the Earthbound Ones to build the Ocean Palace, a mighty temple to aid in harnessing the massive energy source that is Lavos. Dalton is the assistant of Queen Zeal and like her he is very greedy for power. After the fall of Zeal he gets hold of the blackbird and the epoch but gets defeated when he gets summoned into a hole when trying to summon golem boss. Daughter to Queen Zeal and Janus' older sister, Schala is a sympathetic royal who helps aid in the rebellion against her mother. Schala helps Crono and the gang, the Gurus and the Earthbound Ones while keeping good relations with her mother. She has a magical pendant, formed from the Dreamstone that built Zeal, that interacts with the Mammon Machine and other secure aspects of the kingdom. The Chancellor in 600 A.D. The assistant to the king, who was kidnapped by Yakra in a plot to take control of the kingdom. Cyrus is a master knight and the best friend of Glenn. Fiona is a resident of the southern continent, below Guardia. She dies trying to save the forest that once flourished south east of Dorino. A giant frog with a crown, he steals the Hero Medallion some time before 600 A.D., but Cyrus and Glenn fight him to get it back. Cyrus' younger sibling, Glenn struggles with the problems he faces in regards to killing people. Having great skill in sword fighting and the dedication towards his brother, Glenn faces off with Magus and Ozzie in the Denadaro Mountains where he loses both the Hero Medallion and his human form. He becomes Frog, the outcast knight. The elder of the Mystics, Ozzie found Janus in the woods of Truce Canyon one day. He raised him into Magus and then took his role as general and second in command of the Mystics. Queen of Guardia in 600 AD. Gets kidnapped by Yakra, and helps Marle make up with her father. A child who finds the Hero Medallion. Although not actually a hero, Tata wants to prove himself to his family and Porre by fighting monsters near his home. As the gang heads into the Denadaro Mountains, Tata drops the medallion and leaves it without hesitation, as he is really just a frightened kid. A beast who once haunted the western forest of Guardia, Yakra is a part of the Mystics' army and is responsible for the kidnapping of Queen Leene (and other citizens) and the corruption of the Cathedral. The Chancellor in 1000 A.D. 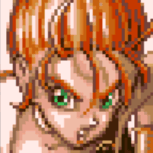 The assistant to the king, who upon seeing Crono return with Marle, makes an immediate accusation of kidnapping and terrorism, and attempts to execute Crono for the crime. Fritz is the son of the man who runs the Market in Truce. He has a sister named Elaine. You'll find him in the torture chamber of the Guardia Castle prison; imprisoned at the start of the game for no explained reason. He can be rescued; if you do, he will help run the family shop in Truce. The King, the last of the noted Guardia bloodline, is Princess Nadia's father. His wife the Queen died soon after the birth of Marle and the loss is difficult for him. His favorite food is Jerky and his health is poor. Lara is Lucca's mother. She's married to Taban and originally had her legs crushed in a freak accident when Lucca was a child. As a result, Lara will always be seen sitting, unless you alter history in her favor. Due to her accident, she grows hateful towards inventions yet she keeps it hidden. The Guru of Life. In the conflict with Queen Zeal, Melchior is exiled to 1000 A.D. The lawyer who defends Crono during the kidnapping trial. Taban is Lucca's father and married to Lara. He is the reason Lucca is such a genius and invents things just as she does. 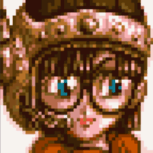 Throughout the game he will reward Lucca with special equipment available only to her. The Guru of Reason. In the conflict with Queen Zeal, Belthasar is exiled to 2300 A.D. The final descendant of Guardia, Doan acts as the elder for Arris Dome. As a kid he used to ride the Jetbike in Lab 32, but he'll give your team its key for giving his people hope. The Guru of Time. In the conflict with Queen Zeal in 12,000 B.C., Gaspar is exiled to The End of Time. Gaspar acts as a guide for the party throughout the course of the game. For more details on Spekkio, see Chrono Trigger/Spekkio. 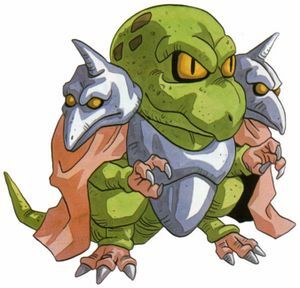 The self proclaimed "Master of War," Spekkio is a shape shifting creature who introduces the art of Magic to Crono and his teammates and will happily fight them at any time to test their skills. Throughout the game, Spekkio grows in strength, changing his form as he does so, and will offer increasingly useful items when each form is beaten. This growth is dependent upon the level of the currently assigned party leader. ↑ 1.0 1.1 1.2 1.3 1.4 1.5 The official SNES game manual. ↑ Chrono Compendium staff (2006). Translation Differences. Chrono Compendium. Retrieved on 2006-08-15. ↑ GamePro: Interview with Chrono Cross Developers. Chrono Compendium (2000-10-17). Retrieved on 2 July 2006. This page was last edited on 21 July 2014, at 17:34.